Following the success of the Outdoor Traverse Panels and by popular demand, Niels Larsen is now able to offer an indoor version. In order to make these more versatile the Indoor Traverse panels are slightly different in size, these being 1200 x 400mm (4’ x 1’4”) and sold in sets of 6. The panels are designed to be installed at low level, the bottom panel being no more than 150mm from the ground, so that the height to the top of this panel is 600mm. The height of the upper panel can be varied to suit the users. 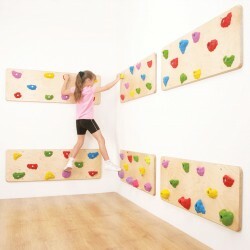 Manufactured using 21mm plywood with a lacquered finish and 10 predrilled and fitted hand holds.